Take your gaming with you. Go big on power and small in form with a chassis that measure’s in at just 18.9mm. Obsidian black and sandblasted to perfection, aluminum covers the chassis in a cool metallic embrace. The Corning® Gorilla® glass plate doubles as a viewport for an AeroBlade™ 3D Fan and a Precision Touchpad, if needed in a pinch. There’s 0.7mm of thin, durable damage-resistant Corning® Gorilla® Glass just north of the keyboard. It’s pretty tough, so tap all you like. 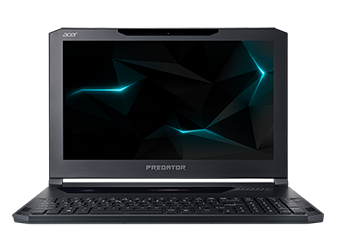 Screen tearing and input lag have no place with the Triton 700’s 120Hz1 IPS display. Keep your game sessions seamless and fluid without missing a beat. It may be light but if you feel like plugging in something bigger, we’ve got you covered. Display Port, HDMI® 2.0 or Type C Thunderbolt™ 3 – You choose. NVIDIA® G-SYNC®1 calms the storm of fast-paced gaming woes by eliminating screen tearing. With your G-SYNC® Ready laptop, you’re good to go.